The Bellanca 28-92 (construction no. 903) was developed by Giuseppe Bellanca in 1937 for Capt. Alexandru Papana. Papana was a Romanian Air Force pilot who planned to use the Bellanca on a long-distance good-will flight from New York to Bucharest. He named the aircraft Alba Iulia 1918 to commemorate the assembly of ethnic Romanian delegates who unified what is modern-day Romania at Alba Iulia, Transylvania in 1918. The aircraft carried the Romanian registration YR-AHA. Alex Papana poses with the Bellanca 28-92. The Romanian registration can be seen on the wings but the name, “Alba Iulia 1918,” has yet to be applied. Note the propellers do not have spinners. The Bellanca 28-92 was a low-wing, single-seat, trimotor design. 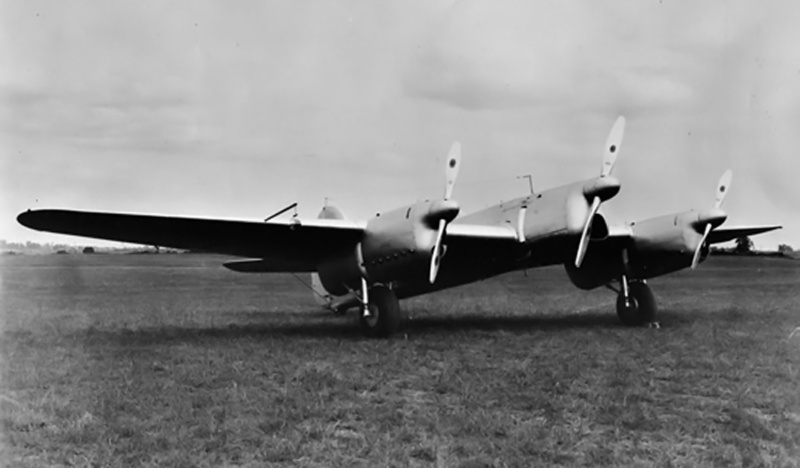 The fuselage was of tubular steel construction and covered by aluminum back to the cockpit. Aft of the cockpit, the fuselage was covered with fabric. The wings and tail were plywood-covered, and the control surfaces were covered by fabric. The main undercarriage partially retracted into the rear of the wing engine nacelles, but the tailwheel did not retract. Installed in each wing of the aircraft was a 250 hp (186 kW) Menasco C6S4 engine. The C6S4 Super Buccaneer was a direct drive, air-cooled, inverted, straight-six aircraft engine. The C6S4 was supercharged and displaced 544 cu in (8.9 L). Each C6S4 engine drove a 6 ft 6 in (1.98 m) diameter, two-blade, adjustable-pitch propeller. The complete 28-92 with spinners and “Alba Iulia 1918” painted on the side. 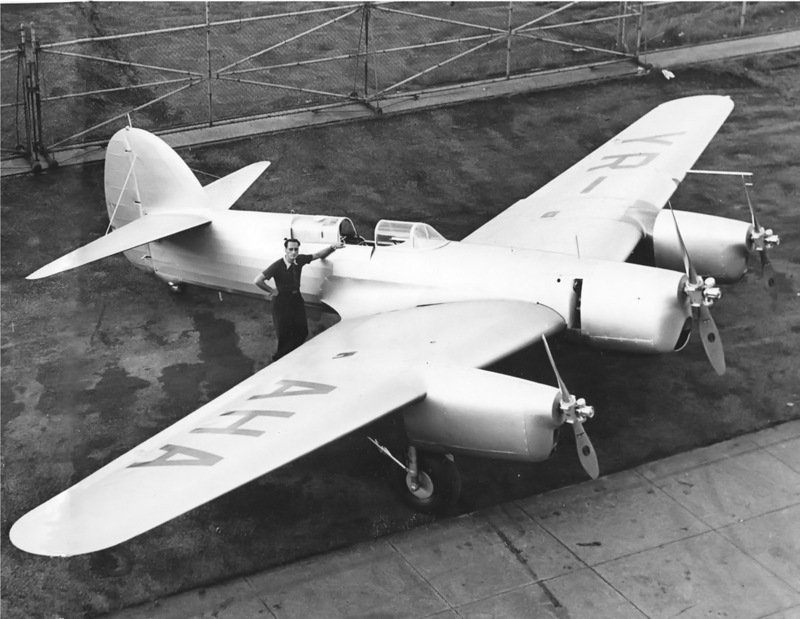 “YR” is painted on the tail, and the registration “YR-AHA” is repeated on the upper fuselage behind the cockpit..
A 420 hp (313 kW) Ranger SGV-770 engine was in the nose of the 28-92. The SGV-770 was an air-cooled, inverted, V-12 engine. The engine was supercharged, displaced 773 cu in (12.7 L), and had gear reduction for the 8 ft 3 in (2.51 m) diameter, two-blade, adjustable-pitch propeller. All of the trimotor’s engines were hand cranked to start. The 28-92 had a fuel capacity of around 715 gallons (2,707 L). The aircraft had a span of 46 ft 4 in (14.1 m), a length of 28 ft 4 in (8.6 m), and weighed 4,700 lb (2,132 kg) empty. The 28-92 had a top speed of 285 mph (459 km/h) and a 3,000 mile (4,828 km) range at 250 mph (402 km/h) or a 4,160 mile (6,695 km) range at 200 mph (322 km/h). Landing speed was 75 mph (121 km/h). Front view of the 28-92 trimotor illustrating the limited visibility from the cockpit while the aircraft was on the ground. Papana was inexperienced with superchargers and inadvertently overboosted the engines during his first test flight in the trimotor. The incident led to a disagreement with Bellanca, and Papana cancelled his order for the aircraft. Since the 28-92 was complete and neither Papana nor the Romanian government paid for the aircraft, it remained at the Bellanca factory. In 1938, Bellanca registered the aircraft in the United States as NX2433 and entered it in the Bendix Trophy cross-country race. Frank Cordova was the pilot for the race, and the trimotor flew as race number 99. Unfortunately, because of engine trouble, the aircraft did not finish the cross-country race. The Ranger engine in the nose quit, but Cordova continued to fly on the two Menasco engines for another 1,000 miles (1,609 km), landing in Bloomington, Illinois. A new rule for the 1938 races stated that no aircraft entered in the Bendix race could compete in the Thompson Trophy race, so the trimotor was returned to the Bellanca factory. Bellanca 28-92 trimotor with Art Bussy at the controls for the 1939 Bendix race. 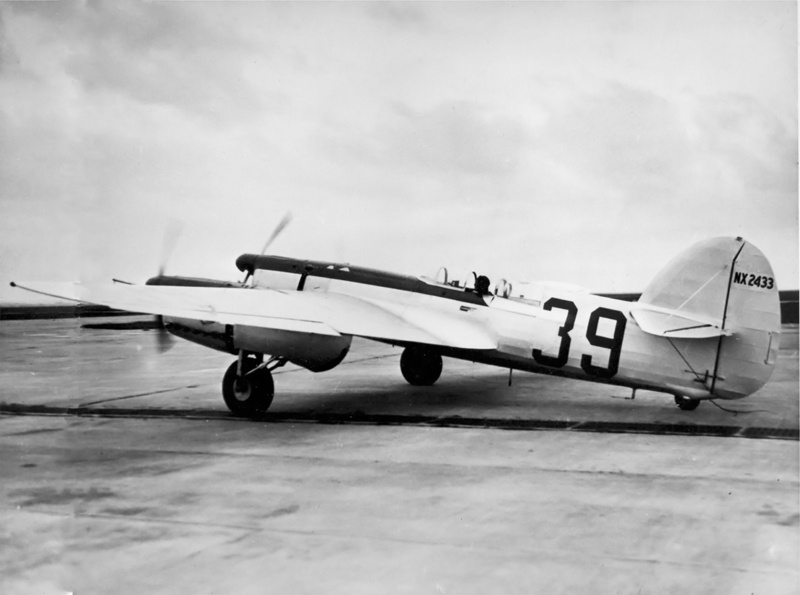 The aircraft looked the same for the 1938 race except the race number was 99. The 28-92 was again entered for the 1939 Bendix Trophy race, this time piloted by Art Bussy. Competing as race number 39, the aircraft finished second in the Los Angeles to Cleveland race with an average of 244.486 mph (393.462 km/h). Continuing on to New York, Bussy and the trimotor again finished second, averaging 231.951 mph (373.290 km/h) for the total distance from Los Angeles to New York. Because of the start of World War II, all air races and record flights were put on hold. The Bellanca 28-92 trimotor was of little use during this time. The aircraft was eventually purchased by the Ecuadorian Air Force and served in South America from 1941 to 1945. Reportedly, the 28-92 was abandoned at a small airfield in Ecuador; a sad end for a unique aircraft. Rear 3/4 view of the Bellanca 28-92 showing the aircraft’s clean lines. *Sources disagree on what number the aircraft used for which year. 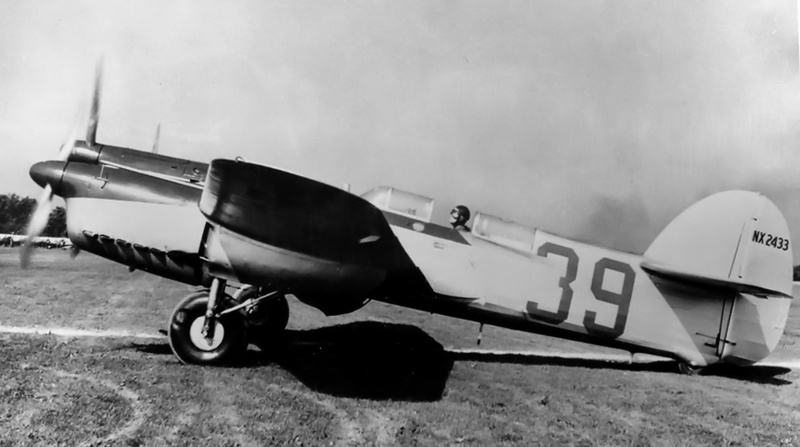 Images reportedly from 1939 show number 39 on the fuselage, but it is possible that they are in error and race number 99 could have been used in 1939 and race number 39 used in 1938. This entry was posted in Air Racing and Records, Aircraft, Between the Wars on 9 October 2012 by William Pearce. Is there any record of what the Bellanca was used for by the Ecuadorian Air Force during WW2? It seems such an unusual choice of plane for a military organisation. I have not run across any info on the plane’s use in South America. It could have been the personal aircraft for an important someone, or just a plane they got and then never flew.